Today’s lunch was outstanding! 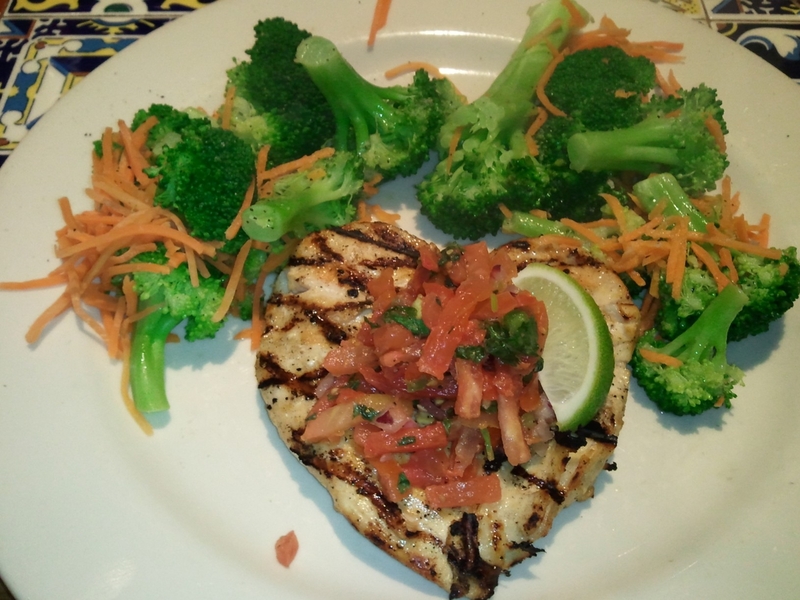 I couldn’t make up my mind where I wanted to go for lunch (really need to start freezing meals to bring for lunch during the week) so I settled on Chili’s. After perusing their menu and drooling over the molten chocolate cake, I settled on the Margarita Chicken. Hold the rice, beans, and tortilla strips and add a side of steamed veggies please! I’m not quite sure why I’ve been so adverse to pico my entire life. That’s not true, it was my prejudice against tomatoes. However, I am a convert. I love me some fresh pico!! I enjoyed the broccoli and carrots, but wish the carrots were a little bigger. The shreds were difficult to get on my fork! For all of you foodies out there: ‘Twas delish! This entry was posted in Good Eats and tagged Good Eats on January 4, 2011 by Tammy. That is one lush and healthy looking meal….I really like the good mix-up of stuff on the plate, and the lime is a great little addition….will have to try that with chicken sometime. It was very good. The lime added just the right amount of twang! I am NOT a vegetable person, so seeing myself eat these meals without so much as batting an eye now is a big accomplishment in itself!